Western Blot: 0.1 – 0.2 μg/mL. Tested for Western blotting using recombinant protein. ELISA: 0.5 - 1.0 μg/mL. 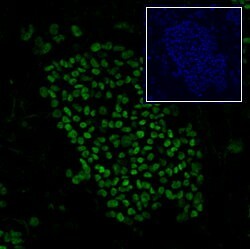 Immunocytochemistry - This antibody has been used at a concentration of 5 - 10 ug/mL to detect human SOX2. Cells were fixed with 4% paraformaldehyde in PBS at room temperature for 20 minutes, then blocked with PBS containing 0.1% Triton X-100, 1% BSA and 10% normal donkey serum at room temperature for 45 minutes. After blocking, sections were incubated with diluted primary antibody overnight at 4° C followed by Rhodamine Red coupled anti-goat IgG antibody or another appropriate secondary antibody at room temperature in the dark for one hour. Between each step, cells were washed with PBS containing 0.1% BSA. Western blot - This antibody can be used at 0.1 - 0.2 ug/mL with the appropriate secondary reagents to detect human SOX2. The detection limit for recombinant human SOX2 is approximately 2 ng/lane under non-reducing and reducing conditions. Jimena Andersenb. Study of Ascl1 function in the neurogenic lineage of the adult mouse hippocampus. Thesis 2015.